I love small-budget/B horror movies. I won’t call it a “guilty pleasure” because I don’t feel guilty about it. I love a good hour-and-a-half of over-dramatic murder scenes and stupid white kids going to investigate a noise they heard in the basement of the haunted asylum. I remember the very first “horror” movie I ever saw was Killer Klowns from Outer Space. It was on the USA network at like midnight and I was sleeping alone in the living room watching TV becasue my parents were irresponsible… or maybe I just pestered them about letting me stay up late and they got sick of arguing with me and agreed… but whatever the case may be, I was SUPPOSED to only be watching Nick at Nite, but I wasn’t, because I was like 10 and who the hell does what they’re supposed to at 10? Anyway, that’s where it started for me. I was hooked on horror movies from then on. We’ve not done a lot of indie-film coverage on 4LN, so when the opportunity arose for me to review an INDIE HORROR movie there was just no way I was gonna turn it down, and I’m really glad I didn’t. Volumes of Blood is exactly what it’s title suggest. Just volumes, and volumes of blood. Like SO MUCH BLOOD. It’s borderline irresponsible… but in a good way. It’s an anthology horror film, which is the latest rage in horror movies, and, honestly, I like this style. Probably the best examples would be series like The ABC’s of Death & V/H/S (both of which you can find films from on Netflix). I would akin Volumes of Blood closer to the latter in that, similar to V/H/S, it has a running plot that each segment ties into. Five tales of dread interwoven when a sociology student gathers several of his friends at the local library to help him create a new urban legend with deadly consequences; Lily is in for a late night of researching and needs something to keep her going. It isn’t until she’s approached by a mysterious stranger that her luck may change… for the worse; a typical night of work for a librarian becomes a classic ghost story with a modern twist. Sometimes you can’t keep a bad book down; Sidney is allowed to stay after hours to study for a test. It’s not until she suddenly awakens in the darkened library that she realizes the horrifying truth of what lurks among the stacks of books after midnight. She better pray she doesn’t become the prey; Paige faces regrets that she’d do anything to take back. When an ancient and arcane spell book literally falls into her lap, she decides to make a grave decision. Be careful what you wish for, it might just kill you. While every segment was really great in it’s own way, I’d like to specifically focus for a moment on the segment that is a “classic ghost story with a modern twist”, titled “GHASTLY”, as this one was my absolute favorite. It was shot in black and white, and there was no dialogue. It was so captivating and creepy. The directing was clearly on-point, the acting was top-notch, and the cinematography, while minimalist, was brilliant. It feels like an homage to the classic horror movie making of the 50’s and 60’s, and that’s something a lot of filmmakers just can’t pull off nowadays. While “GHASTLY” happened to be the segment I was most drawn too, the entire film really does deserve credit for being so fantastically self-aware and utilizing that to it’s advantage. Each segment stands on it’s own as a clever, creative, and gore-tastic piece of film-work, and when strung together they make a disturbingly delightful buffet of terror and blood… VOLUMES of it. We’re going to be screening VoB on Sunday, October 25th, at our new favorite comic shop in our hometown of Hendersonville, TN! Check out the link below to our Facebook event for more details! 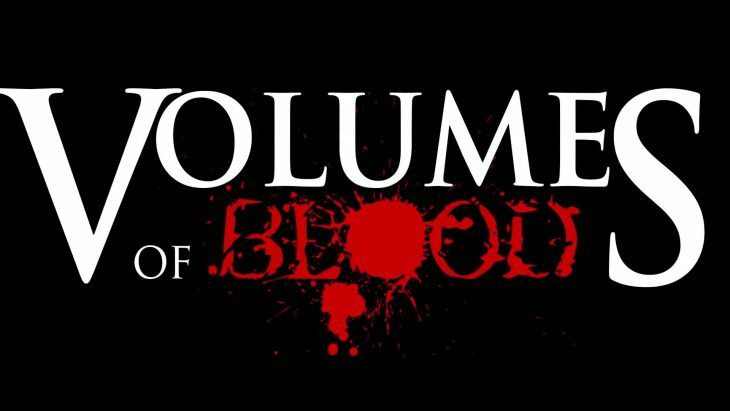 Also, here’s the just released 2nd trailer for Volumes of Blood to get you pumped!